I am in London as I follow news of this terrible slaughter. The president is so right - every parent will feel this tragedy deep in their hearts. But politics is never far away. Only hours before, I had been explaining to British friends that most people in the UK just did not get the American attitude towards guns, with many regarding it as a sort of crazy aberration. But it is just different. Americans believe they have a right to own guns, not just for sport or hunting but for self defence. That right is embodied in their most revered political document, the constitution. Guns are much more a part of every day life than they are in the UK. That is why some insist that they should even be allowed to own weapons which are designed for no other purpose than to kill a lot of people, quickly. It is also why when, after past shootings when the inevitable question comes from the news presenters: "Mark, will this make a difference? ", the answer has been a firm "No". But perhaps, just perhaps, it will be different this time. 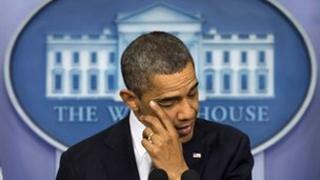 President Obama, apparently repeatedly wiping tears from his eyes, said: "We've endured too many of these tragedies in the past few years… As a country, we have been through this too many times." He added pointedly: "We're going to have to come together and take meaningful action to prevent more tragedies like this, regardless of the politics." Well, after the 2011 shooting in Tucson, Arizona, of a congresswoman, in which 13 people were injured and six killed, he also said: "We cannot and will not be passive in the face of such violence. We should be willing to challenge old assumptions in order to lessen the prospects of violence in the future." Nothing happened, and as far as I remember, there were not even any tentative proposals to bring about any change. But since then, there has been an election. Mr Obama now shows signs of pushing the issues he really believes in with a greater vigour and confidence. To seize gun control as such an issue would indeed be bold, and very difficult. We will have to see if his emotional speech is ever turned into action.